of the Butterfly furniture I used in my Christmas post. I chose to use very vintage furniture in it at this time. It has a plexiglass top and front. The Butterfly room box is rare and fairly hard to find. This one is totally orginal. This is an old German made clock. This is an adorable gate leg table. Clueless on the age or maker. Old German made table and chairs. They also match the settee. I have no idea about the age or maker of this buffet. This is Violet and Ed they reside in the room box with there two cats. It looks like the O'Hares have dropped by to wish them a Happy Easter. How nice they brought Violet and Ed an Easter basket. Of course Violet will insist they stay for dinner. and purchased a new ( old) corner shelf. I think it does look better with her furniture. except for a cookie stealing mouse! This is a Sonia Messer room box. the Goebel miniature Butterfly collection. And to meet his new young wife Suzy. They are to have dinner and watch the game on TV. Suzy has a maid and cook to do all of the work. Suzy said" I know we will eat in front of the TV. and say what we are thankful for." Fred said I will start. "I am thankful for Suzy." Suzy smiled and said " I am thankful for Fred." had Suzy sign a pre-nupt." Ebay and thought black suit, black tie, what a sharp dressed man. I need to bring him home and see what the ladies think. It seems they can't keep their hands off of him. All the girls do, like a sharp dressed man! This small Keystone was made in 1943. That was not a small job. He had a lot of witches to contend with. Luckily he lived to retire. Not everyone can runaway to Kansas! LOL! This is the inside of the Becker home. I have to wonder, if the black cat on the table is a munchkin cat? Aron and Margo Priestly have their house all decorated for Fall and Halloween. Kitty seems to like the hay and pumpkins. It is just not Halloween without a coffin and a skeleton. As long as you don't need a coffin. And you aren't the skeletion! Here are some of the trick or treaters, they had that evening. Aren't they cute? The night has finally ended. They settled down to enjoy the last two candy bars. Will he knock and say "Trick or Treat"? Or will he use the chain saw, like in " Texas Chainsaw Massacre,"
and cut them to pieces? It is only an Elvis Presley impersonator trying to scare them out of last two candy bars. But I have to say if I were Margo and Aron I would give him the candy. Just to be on the safe side. LOL! Embellished, bedazzled whatever you want to call it Strombecker! This 1937 Keystone finally gets furniture and some one to live in it! This is the lady of the house her name is Ann. Her living room has the red and gold embellished Strombecker living room set. It was made from 1931 to 1933. It is one inch scale. This is Ann's sister and her husband she invited them over for dinner. For some reason Strombecker did not do an embellished Kitchen. Guess they didn't want to over do it. HA!HA! There is a big buffet that goes with this set, however it will not fit in this dining room. Green and gold piano in the music nook. This the green and gold bathroom set. And it seems Ann is up to her usual antics. Her sister is leaving in a huff because Ann was being Ann. She Invited Clara and Bill to dinner. But Clara had to cook it and clean the kitchen. Because Ann wanted to read. So I guess the moral to this story is, don't go to Ann's for dinner if you don't want to cook. LOL! 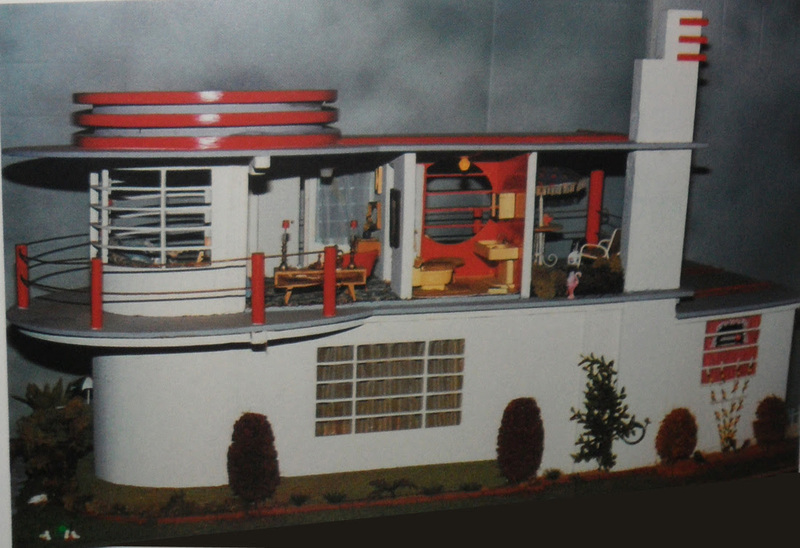 The most magnificent dollhouse EVER! The plans were in a Popular Mechanics in 1937. It is signed Merry Christmas and dated 1937 on the bottom. 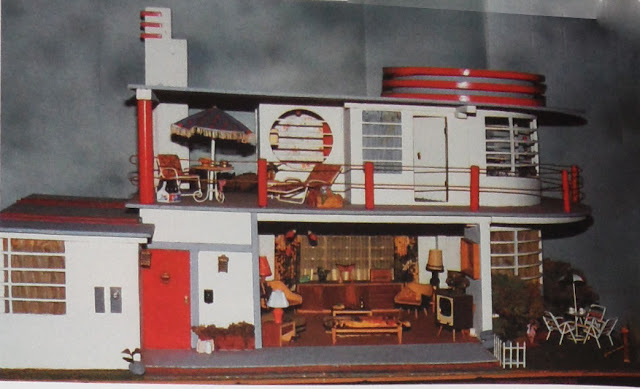 When I first started dollhouse collecting I found this gem in a dollhouse book. I fell in love with it instantly. I thought it was fantastic and knew I would never see it let alone own it. That was nine years ago. My feelings have not changed. I have many houses I love. Just like I told the owner this is the Ultimate dollhouse to me. The collector was down sizing so I thought it never hurts to ask if it is for sale. I found out if you cry, and beg, and plead sometimes you get what you want. LOL! The owner being such a nice person said yes. My dream house was actually going to be MINE! It was so hard to believe, I was walking on clouds! This is a picture of it just off the delivery truck. Can you imagine my excitement? My dream house is right there in that box in front of me! My first look at the ultimate dollhouse. Not quite what I had pictured in my mind. Well I don't have to tell you, I was upset. Or heart broken, disappointed, angry, sick, and in tears. This has been a few weeks ago. The delivery service did pay the insurance. Which does not heal the wound. But at some point you have to accept it is, what it is, and make the best of it. So now we will see if there is anyway I can put it together again. It will never be the piece of art it was. I am just hoping to make it presentable. This is a restoration attempt. I want it to look and be decorated exactly as it was by it's previous owner. I will share pictures after I give it my best shot. Wish me luck because I will need all I get! "If it is, you got your hourglass figure back!" In a faraway land there was a 1930's Keystone with the new residents. This is all Really Truly furniture except the plant stand. It is Strombecker. This is the couple that live in the country cottage. She certainly is a gardener,. look at all the flowers! It has always been a dream of Ben and Belle's to move to France to retire. They will live happily ever after. and windows that were needed for the house.